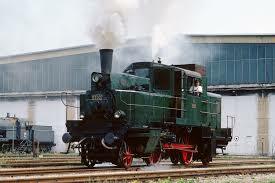 During my travels in Austria, back in the 60’s, I ran across this odd looking steam locomotive. It caught my attention as I had never seen one quite like this before. It reminded me of the old ‘Glass Box’, but this one was bigger. It had both, pilot and trailer axles. Between 1935 and 1938, the Austrian Railroad (OBB) purchased twenty samples from the Lokomotivfabrik Florisdorf, located in Vienna. It was initially designated DT 1. The engineer’s cab was fully enclosed and there was a fully enclosed luggage compartment behind the cab. 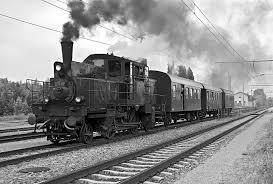 This meant that it was classified as a rail car (Triebwagen). DT stands for ‘Dampf Triebwagen’ (Steam Railcar). 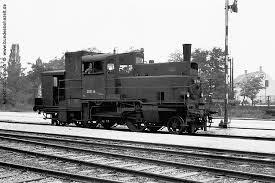 Samples of a similar model were also purchased by the Slovakian Railroad (SZ), where they were designated M 273.1. It was designed for one man operation, utilizing an automated coal feed system. On a good day, she was able to do about 65 mph which is surprising for an engine of that size. It could do this in both directions. It was originally intended for light fast passenger service, but it wound up being used primarily on branch and trunk lines, doing both, passenger and freight service. Often it could be found in the middle of a given train consist, thus enabling the train to run in both directions without having to perform shunting maneuvers. For some reasons, it earned the nickname ‘Dorftrottel’ (Village Idiot). This does not sound very flattering. Who knows why the locals came up with this. After the annexation of Austria to Germany, the whole fleet was now in possession of the DRG and was re-designated BR 71.5, operating out of Munich, mostly for shifting and industrial purposes. Two specimens did not survive WW II. After 1945, the remaining 18 went back to Austria where they continued service, but now designated Reihe 3071. They were stationed in the Vienna area until they were retired in 1968. One of them (DT 1.07) was preserved and can be seen at the Strasshof Railroad Museum. In 1993 it was refurbished into operational condition. Not too long ago, Roco offered them in both, DC and AC versions. It may be worth looking for one. Perhaps, Roco will bring them back. At the time of this writing, Reynaulds may still have an AC 3-rail version available. If you want one, give them a call. I am working on an old steam rail car. Are any photos avail on the drivers cab or engine controls?